In my last post, I recommended Anna Wijaya Salon for hair spa. Today, I’m going to share my hair perming experience at Nobu Salon in Citywalk mall. After the perm – Ivana and I with our new curls. I’ve had straight hair all my life and have longggg wanted to go for a perm but never had the guts to do so. My hair is awfully thick – if not maintained well, I’ll totally blend in with a troop of lions. And so I always had this fear that perming my hair would make me more lion-ey. But…I finally got down to doing it last Wednesday. I guess it was now or never. Many of my friends cut their hair at Nobu Salon and have nothing but praise for the hairstylists there. By the way, all their hairstylists hail from Japan. The local workers only assist/support them and help out with the hair washes. Embarking on a digital perm. A digital perm is a perm that uses hot rods; the temperature is regulated by a machine with a digital display (hence the name digital). My hair was first soaked in perm solution. Following which, sections of my hair were rolled into curlers and plugged into the heat generating machine. The time required for a digital perm is usually shorter than that of a regular perm. Hair all rolled up in curlers and plugged into the machine. After some time, my hair was given a neutralizing liquid. Once the liquid was spread evenly throughout my air, Manabu opened the rollers one by one. BOOOOOOM. My hair had turned from straight to currrrly! About to open the rollers for Ivana’s hair. After the final rinse, Manabu taught me how to blow dry my hair daily. The routine involves a lot of inward twirling, bouncing and hand work. I am so glad my hair didn’t turn out (too) big. It looks kinda natural, you think? BEFORE: Straight hair and Freckles. AFTER: Curly hair and Freckles. Nobu Salon issued me a membership card for free; I was entitled to a 10% discount for my current bill and future bills. The cost of my haircut was IDR 500k, the straightening was IDR 250k, and the digital perm was IDR 1,800,000. After the 10% discount, the total bill came up to IDR 2,295,000. My total bill for cutting, straightening, and a digital perm. My curls had almost disappeared after 5 washes *sobs*. I’m not sure if it’s because I had previously straightened my hair and it was therefore resistant to perming?! Ivana’s hair, in comparison, was still very curly. My hair was thinned further and slightly shortened. It’s been exactly a year since I first wrote about Volunteering in Jakarta: Kampung Kids (dated 26 Feb 2016). And today, one year on, an article was published on Straits Times Online titled ‘Singaporean volunteers bridge education gap in South Jakarta‘. Working with the children from Kampung Kids has been a wonderful learning journey for both Dianne and myself and this write-up is a lovely keepsake of our time spent there. Singaporeans Deborah Lee and Dianne Goh sat on tiny chairs, with half a dozen curious preschoolers at their feet. Their eyes widened and narrowed and their voices rose and fell as they recited each line from “The Three Friends”, a children’s story about animals. In a smattering of English and basic Bahasa Indonesia, the volunteer teachers tried to make themselves understood. Unsure of the Indonesian term for elephant’s trunk, Ms Lee resorted to using hand gestures. She balled one hand into a fist, put it in front of her face and extended it outwards. “This is elephant’s trunk,” she said. Ms Goh chimed in: “Trunk. Not nose, OK? Trunk.” The children nodded. After the story-telling session, they played videos on their i-pad and led the class in singing and dancing to simple tunes such as “Head, Shoulders, Knees and Toes”. 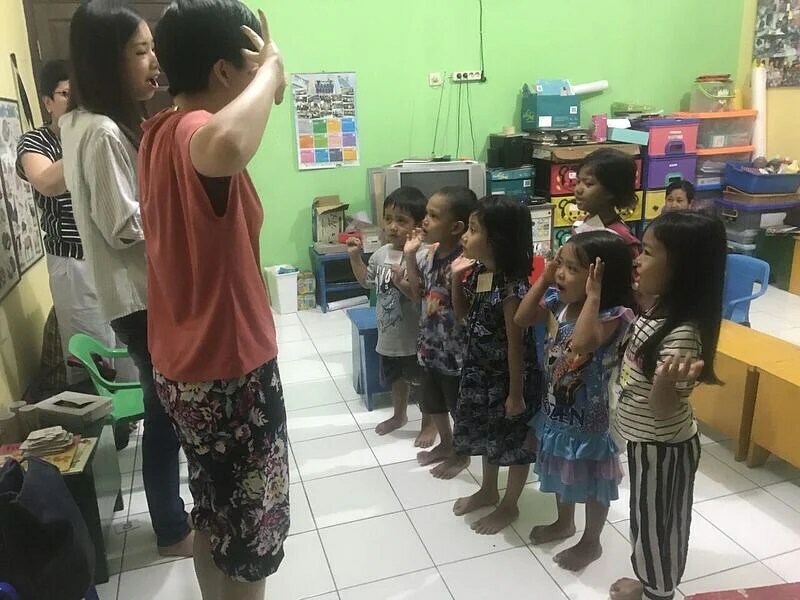 Ms Lee, 29, and Ms Goh, 28, are among 20 volunteer teachers at the Yayasan Kampung Kids, a foundation in the poorer neighbourhood of Pejaten in South Jakarta which has been running free educational, as well as food and nutrition programmes for the underprivileged for nearly two decades. Ms Lee has been volunteering there since 2015, shortly after moving to Jakarta where her husband is stationed for work. Ms Goh did the same last year. In a country where pre-primary education is not compulsory, and most of the kindergartens and nurseries are privately-run and expensive, volunteer teachers like them are much welcomed. The government has been increasing funds gradually for early childhood education and plans are afoot to build an education centre in every village across the country. In the meantime, foundations like Kampung Kids are helping to fill the service gap. 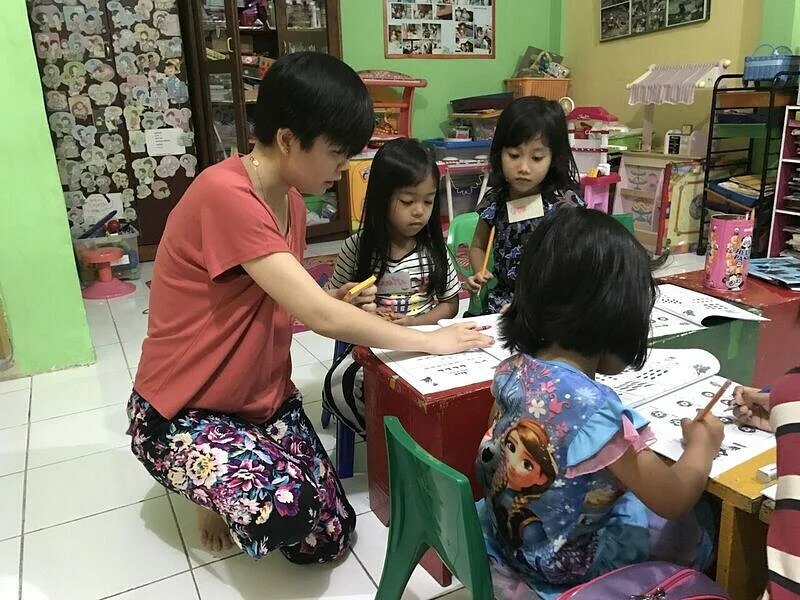 Housewife Sumarni, 45, said she would have to fork out anywhere between one and five million rupiah (S$105-S$526) to enrol her five-year-old daughter Nurita in a regular kindergarten, and another 300,000 rupiah every month for school fees. “All parents want the best education for their children. But not everyone can afford that,” she said. The biggest challenge for the Singaporeans, as expected, is the language barrier. But they say this has only spurred them to get creative. Ms Lee, who holds a Master’s degree in Child Development and Education, had taught English and Mathematics to primary school pupils in Singapore and wanted to continue helping the local community. 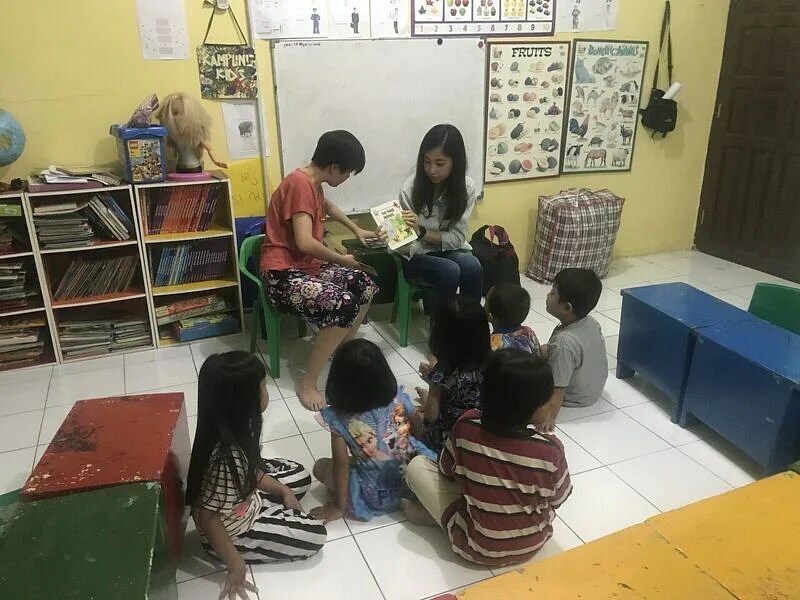 “The children hardly understand or speak English while I’m not very fluent in Bahasa Indonesia,” she said, adding that she conveys her messages by drawing pictures and playing charades. Sometimes, the mothers who sit in during the lessons will help her explain to the children. Struggles aside, they aim to make lessons fun through songs and get the children “used to listening to English”, Ms Goh said. The parents say they appreciate the efforts of the foreign teachers – including those from Singapore, India, Australia, Britain and the US – and do not mind that they are not fluent in Bahasa Indonesia. “They could be doing something else with their time, but choose to come here to teach our kids. I’m just grateful,” 30-year-old Fitriyah said. Agreeing, housewife Nenah, 32, said that her daughter would sing English nursery rhymes at home and tell her that she looks forward to going to school. “I hope my child will be able to master English so she can interact with people other than Indonesians,” she said. For the Singaporean teachers, sharing knowledge goes two ways: The pupils and the parents have not only expanded their Indonesian vocabulary, but have also given them valuable life lessons. “They taught me so much more beyond the four walls of the classroom,” Ms Lee said. “Despite not having much, the children are very content and carefree. I’ve also learnt to be content in life, in various situations and circumstances,” she said. The original article with the video can be found at this link: http://str.sg/4nxg.